We had a couple of glorious days last week which were just ideal for a long bike ride. I don't often take the ferry over to Portsmouth as it can be hard to avoid the major roads and urban sprawl en route to pleasant cycling on the the South Downs but I'd had this route in mind for a while. It is based on a route that was featured in 'Cycling Plus' a couple of years ago but adapted to suit a different start point and further adapted on the hoof when I got lost! The basic idea was to follow the course of the river Meon from where it enters the sea at Tichfield Haven to its source near the village of East Meon. Its not exactly on a par with journeying to the source of the Nile but I only had a day! I also intended to climb the highest point of the South Downs for good measure. Obviously a trip to the mainland (or North Island as we prefer to call it!) requires a ferry crossing but this ride needs two. First the Wightlink ferry from Ryde to Portsmouth. This route now sports a posh new ferry complete with bike rack. Full marks to Wightlink for this, enabling Roberta to sit in solitary splendour! Straight off this ferry, through the railway station and on to the Gosport Ferry.This has only a rail to lean bikes against despite being used by huge numbers of cyclists. They charge an extra 80p for bikes too! Its only a five minute crossing so I was soon heading along the coast towards Lee on the Solent with the Isle of Wight to my left. 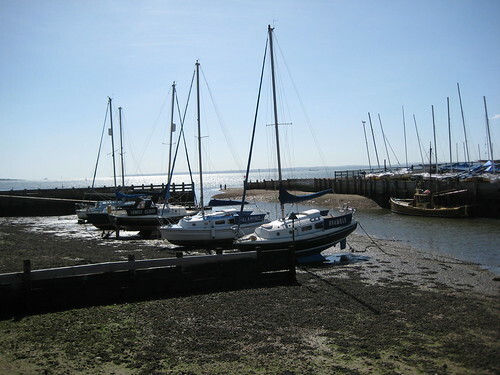 Titchfield Haven is a pretty place with lots of yachts and a large nature reserve that feels a world away from Gosport. It is also where the Meon joins the sea and so the start of the ride proper. 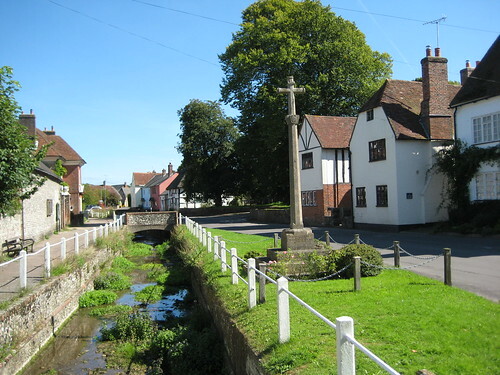 A winding lane led me to the picturesque little town of Titchfield and onto a thundering dual carriageway which I walked across at the lights. Once under the motorway I was into open country and pleasantly surprised by how little traffic was about. I was now following the 'Cycling Plus' route but soon managed to lose it (must get a GPS)! The lane I was following became progressively steeper, narrower and rougher and I had a nasty feeling I was heading for a dead end. I'd gone too far to feel like turning back so I pressed on hoping that I'd find a signpost or someone to ask. Eventually I spotted a lady walking a dog. 'Am I going in anything like the right direction for Bishop's Waltham?' I asked. Her face said it all. I was now several miles east of where I'd intended but it was simple enough to rejoin the right route once I finally emerged into Droxford. A roller coaster of a road took me by a series of steep climbs then great swooping descents but finally climbed to the top of the downs. The views were excellent and I decided it was high time for lunch on a grassy bank at the edge of a pub carpark. 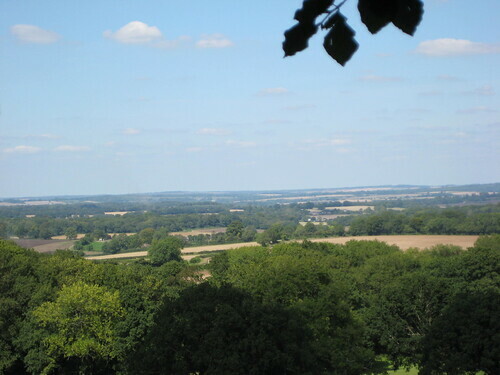 A fine road led across the downs to Warnford before dropping down to West Meon and then along the river valley to the pretty village of East Meon where the river was little more than a trickle, being very close to its source. There was only one way to go from here – up! Up to the summit of Butser Hill, at 270m (886') the highest point on the South Downs. I checked my directions with an elderly lady tending her garden. 'You must be jolly fit if you can cycle all the way up there without getting off' she said, in an accent usually only heard on films about the Raj! I replied that I couldn't promise anything but I would do my best. We agreed what a beautiful day it was and I continued on my way. The road was long and narow and I had to stop for a pickup truck coming down. The driver gave me a cheery thumbs up and I took the chance for a crafty breather before remounting. The last bit was the steepest but I was soon standing on the top of the world! Its not really very high as hills go but it has superb expansive views in all directions. The remains of my flask disappeared rapidly and so I took full advantage of the tea kiosk to enjoy another cuppa while admiring the view. It really should have been all downhill from here but life just isn't like that and I somehow managed to find a couple more large climbs on the way back! It was now after five o'clock and the roads that had been so quiet on the way here were swarming with traffic. Visibilty was difficult cycling due south into a low sun, and I was worried that if I couldn't see the road very well, following traffic might not see me. However I made it without mishap to the quieter roads on the coast. The Isle of Wight across the water was a welcome sight. 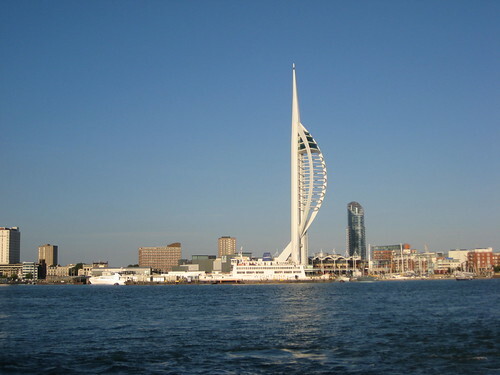 The sky was a beautiful clear blue and Portsmouth Harbour looked lovely from the Gosport ferry. 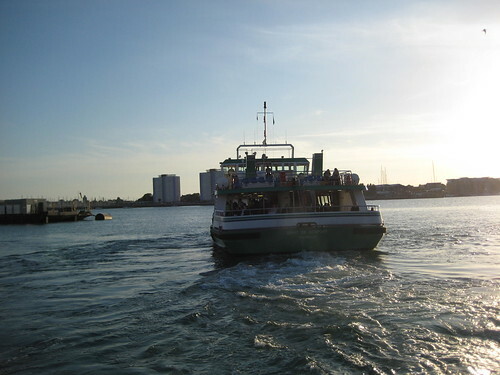 The Gosport boat sailed off into the sunset as I walked my bike round to the Wightlink pier. I'd covered 80 miles by the time I got home and made full use of a glorious late summer day! Posted by Hilary on September 10th, 2010. 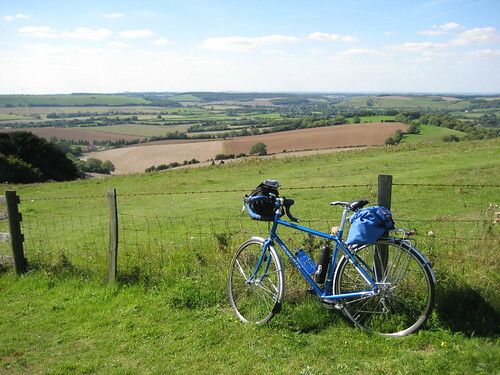 Hilary, your stunning bike matches the sky! What a fab post, love that very final pic, it says 'Im comin' home....' all over it. 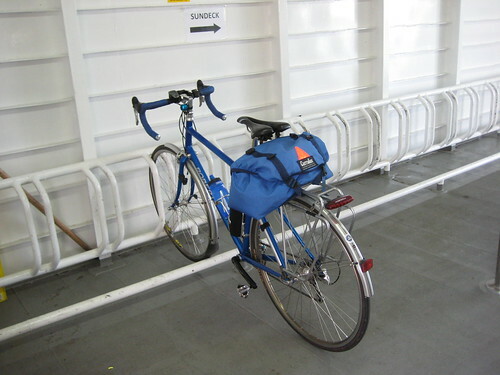 I shall add, that I am somewhat envious of the bike rack on the ferry boat. The IOM one shoves your metal companion in a cupboard full of boat maintenance gear... Not so splendid. Its really such a good feeling to have such a great day out and about. Blending with nature we are! I cycled for years with a fellow who thought that bikes should be red or black, NOT blue! We used to rib him endlessly about that statement! My bikes match snow. So not too keen on that look.